Updated Sept. 24, 2018: Thanks to your efforts, The Expanse has advanced into the final round of the E! People’s Choice Awards for The Sci-Fi/Fantasy Show of 2018 and is facing off against Shadowhunters, Supernatural, The Originals and Wyonna Earp (which advanced as a write-in). The same rules from the first round apply and are outlined below and voting is until Oct. 19. Turbo voting where votes count twice is Oct. 4 through Oct. 8. Congratulations to the cast, crew and production of The Expanse for being nominated! 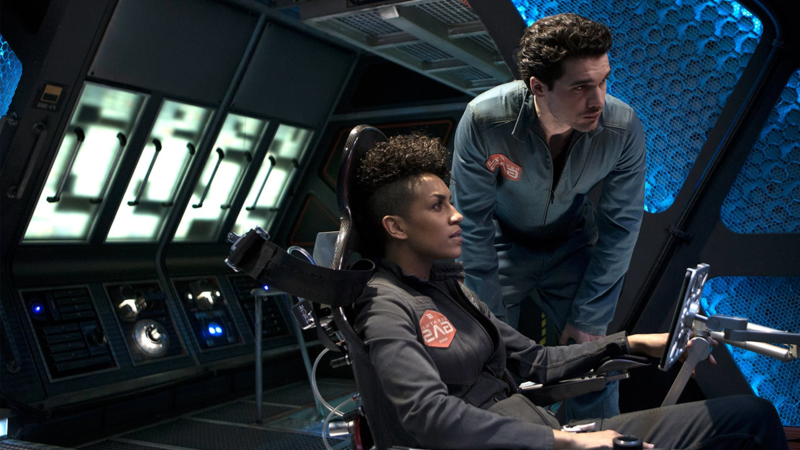 Now, fans of The Expanse will have yet another opportunity to show their appreciation for the show they love. Click to vote on E! Online. These two hashtags have to be used for your vote to count: #TheExpanse and #TheScifiFantasyShow. Here’s the critical part. According to the rules, “Each limit is per person, per Voting Method, per category, per day…” Meaning, you can vote 25 times a day on each platform — for a grand total of 75 votes a day. In addition, from Oct. 4 to Oct. 8, that’s the Turbo Voting Period where the rules state “All votes submitted during this time count as 2 votes,” meaning on those days your 75 votes will count up to 150 times! Insane, right? To make it easy for you, I have pre-generated buttons here that will automatically include the proper hashtags when you click on them. Click to vote on Twitter. Or if you prefer, you can retweet other people’s votes on Twitter, and those will count as votes, too! Here is a collection of the latest tweets with the proper hashtags #TheExpanse and #TheScifiFantasyShow that you can simply retweet. Click to vote on Facebook. Remember, you have to include both hashtags #TheExpanse and #TheScifiFantasyShow in your posts in order for your vote to count! And again, each platform lets you vote 25 times a day. The show in the first round faced some stiff competition from some of the top shows in the genre: Supernatural, Doctor Who, Arrow, Supergirl, Once Upon a Time, Shadowhunters, Black Lightning, Marvel’s Luke Cage, Marvel’s Jessica Jones, Cloak and Dagger and The Originals. To be nominated is an honor all its own, so congratulations to the cast and crew of The Expanse and to Alcon Entertainment for doing such a fantastic job. This is a show that is so well-written and gets such moving performances it truly deserves any and all recognition. Online voting in these types of contests is very much like a push-poll, however, and having a good or even outstanding show like The Expanse is not enough. Fan bases have to coalesce and focus their activism to move to the next round. Thankfully, y’all are pretty good at that. We’re up against some shows that have been around a lot longer and have far more established fan bases. Meaning, if the rules say you can vote 25 times a day on the website, 25 times a day on Facebook and 25 times a day on Twitter for a total of 75 votes a day, and you want the show to win, you really have to vote 75 times a day. Just saying. This is no time for half measures. Let’s do our part! Vote for The Expanse as The Sci-Fi/Fantasy Show of 2018! R.D. Giordano is a contributing editor at The Expanse Lives.